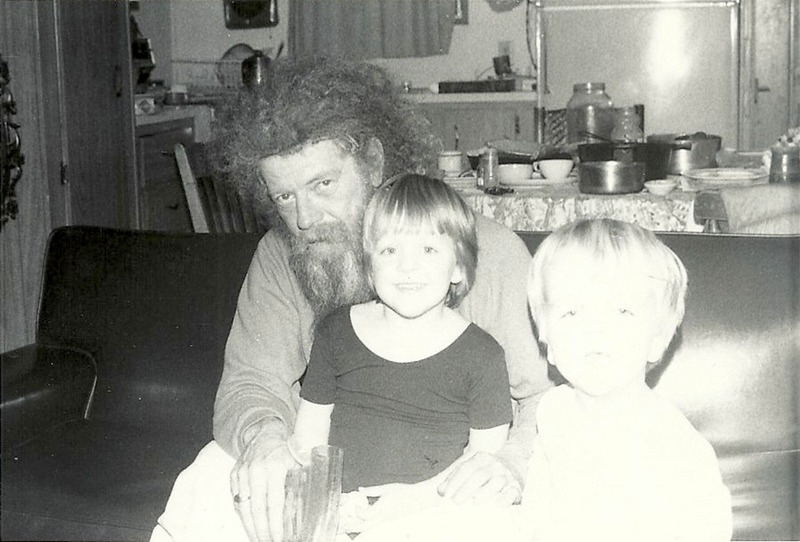 Here is Bobby, our Christmas Visitor with the children sitting on his lap on Christmas morning in 1984. We lived on Maple Street in LaConner. Eugene was 7 and Eva was 5. On Christmas Eve, before it got dark, we walked out to Fishtown just for fun. That's where we met Bobby. He was camped out in one of the empty shacks. It didn't seem like a good idea to ask him too many questions about where he was from and what he had been doing. My feeling is that he was on the run, not a hippie, more of a desperado, robbed a bank in New Orleans or shot a federale down in old Mexico -- something like that. But without thinking too much about it, we invited Bobby to come stay at our house for Christmas. ....... He came to our home and played with the children for hours and hours. It seemed he did not know about families and domestic stuff like that, but he was glad for the chance....... I don't know what his habits were, but I figured he could be on good behavior for a day or two. The day after Christmas, I gave him twenty bucks and sent him on his way..... That was 32 years ago. I might wonder where he is today.... Anyway, the nights get cold in December and you might invite a stranger into your home at times like this. Are we a nation of good tippers? Are we a nation of good tippers? Can we be proud of this? I hope so. This came up at the restaurant last night. I said Canada is a great country and they have good national health care, but we tip better. Three of my garden customers tipped me this week. Two with cash, one with a flash frozen silver salmon filet. All good. Thank you. Martin was a Latino man of age 30, quiet, with good manners. He had served a prison sentence for arson, but I never got the details -- didn't want the details..... Mainly I noticed small things about him -- that he had no nervous twitches and he enjoyed petting the cat. You can co-inhabit with such a fellow. At this point in 1989 I was separated from my wife. She and the two children were living a mile away and I had dinner with them most nights. But I was living at the old farmhouse on Martin Road. This was in Mount Vernon. The old farmhouse was on a forty-acre plot that once had a dairy, but in 1989 it was only blackberries and alder -- plenty of firewood from the alder, but not much else. It was given to Friendship House, the homeless shelter, to be occupied. And Friendship House gave it to me. There was no rent to pay -- of course there was no running water and no electricity either, and not much basis to charge any rent. The owner didn't care about the money anyway. He just wanted someone to occupy the house and keep the ruffians and vandals away. So that was me and my wife and two kids. After a year's time I had the money for a waterline from the road. That cost $1,000 just to get the water to the farm side of the road. But how to get the water to the house involved digging a ditch 250 long. I did that, with the help of Singin' Dan from Fishtown. Later we got electricity. And later the marriage broke up and my wife and two kids took the good apartment. But the old farmhouse was good enough for me, and they asked me at Friendship House if I could take Martin and Paul off their hands. I knew Martin would be all right. But Paul was a challenge. Paul was 22, big, fat, and jovial. His mental development was about age 10. He was schizophrenic and medicated. The idea -- and I really think it was me who was stupid enough to have this idea -- was to bring Paul out to the old farm and get him to work. A little fresh air and exercise would do him some good. If he helped me chop and load the firewood, he might feel a little confidence that he could do some honest work like any other man. He might lose a little weight. He might need a little less medication. Worthy goals. But it wasn't easy working or living with Paul. It was like this -- he would look up at me with a big smile and say, "Fred, you're my best friend." Fine. Except he would say that again five minutes later. "Fred, you're my best friend." And 25 to 50 times a day, those same words. It got tiresome. The problem is that I had Paul to look after seven days a week and that wasn't the deal. Friendship House figured if they left Paul with me that would solve their problem of looking after him. But they never gave me the backup they promised. So sadly, I sent Paul back to Friendship House after about two months. Eventually they found him a good group home, so it was all right for Paul. Martin was never a problem, but he had to leave when I had my two kids move back in with me and my ex-wife went down to Seattle for a while. I was more involved with homeless people back then. Today if I see some fellow with a cardboard sign by the road I avoid eye contact. I was listening to a Gordon Lightfoot CD and thinking what a great singer he was, assuming he was dead. We were in the car, driving back from Phoenix to Santa Barbara, after a four-day festive visit with friends. We were listening to Gordon Lightfoot sing the Early Morning Rain and the Wreck of the Edmund Fitzgerald. Driving west on Interstate 10, it takes 8 or 9 hours to drive from Phoenix to Santa Barbara -- 510 miles across the desert. Gordon Lightfoot was singing his old tunes, plus so many that I had never heard before and he is such a good story teller. I was driving. Laurie, my major, major girlfriend, was in the passenger seat and she has a smart phone. So I said to her, "Is Gordon Lightfoot dead?" She answered, "I don't know, but I can look it up." She found out that he is alive and well and still performing. "Still" is the word we use for our ancient ones. We say that he is "still" performing, meaning he might croak any minute. We might avoid using that word -- "still" -- when referring to our elders. Still breathing -- you're goddam right and I will knock you on the head with my cane if you say that again. Lightfoot, according to Wikipedia, was born in 1938 in Orillia, Ontario, making him 78 years old. He was married for 22 years to a woman named Elizabeth Moon, although they were separated for about half of those 22 years -- no need for an explanation -- Lightfoot is a touring musician and the settled life is difficult for those folks. One more surprising and endearing fact. Lightfoot has a son named Fred. Fred Lightfoot. That's a pretty classy name. At 8 p.m. on Sunday night it is 32 degrees in Aleppo. I monitor the weather in Aleppo because it is a fact. It is a fact of nature that affects everyone equally. It is 32 degrees in Aleppo whether you are a brutal killer or an innocent child. We are all the same under nature's sky -- 32 degrees means you need shelter and heat -- whoever you are. And 32 degrees is pretty cold if you are scrunched up next to a wall that blocks the wind, covered with one blanket, waiting for a green evacuation bus taking you to someplace unknown. Unbathed. Unfed. Cell phone battery going dead.... Cold. When I was young and footloose, I often slept out rough, in the cold. It can be worth it -- enduring the cold, sleeping on the hard ground -- if you want the freedom that comes with it....... But not anymore. I will accept obligations if I can secure a warm bed at night. And I am thankful for the warm and peaceful home I enjoy. It is not wrong to call someone an old woman. Mabel lives across the street from us. She is 95, born in 1921. She has a valid drivers license but she decided it was time for her to stop driving, so I take her to the grocery store once a week. She is a sturdy old soul, born and raised in Montana, the 6th out of 11 children. She rode a horse to school in the subzero cold and did chores - living on a ranch. You learn to get along with people when you grow up in a large family, she said And you learn to take things in stride. We were poor but we didn't know it. Everyone was poor. We had it better back then -- in some ways. And in some ways it's better now -- she didn't say that, but I expect she likes indoor plumbing as much as anybody. Here is a Wikipedia link to Maltese. Maltese is spoken by 520,000 people on the island of Malta. It is a variant of Arabic, but written in the Latin alphabet....... There is lots of cool stuff like that on the Internet. Over 5,000 languages are spoken throughout the world. I have a pretty hard time with just English.